For value your child will love to wear, the JERZEES 29B Youth 5.6 oz. 50/50 Dri-Power T-Shirt is made with the quality, variety and safety parents appreciate. 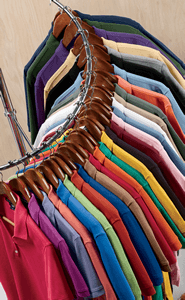 Clean, balanced 50/50 poly/cotton preshrunk jersey feels great and is a very versatile fabric blend. A 1x1 rib collar with two-needle coverstitching on front neck bounces back into place after being washed and worn. This shirt also complies with the tracking label requirements of the Consumer Product Safety Improvement Act, ensuring parents will be informed of any safety-related information. As your kiddo runs around, moisture-wicking fabric will keep him dry, and he won’t be bothered due to the tear away label and shoulder-to-shoulder taping. For those looking to add graphic designs, the shirt was quarter-turned during the manufacturing process to eliminate center crease and has a seamless body to allow for an extra wide printing area.